Protect yourself from Fraud and Fake CPR ACLS & PALS cards. With the new 2015 updates from the American Heart Association comes eCard which are electronic equivalent of a printed course completion card. eCards are valid course completion cards and can be presented to employers as proof of successful completion of an AHA course. 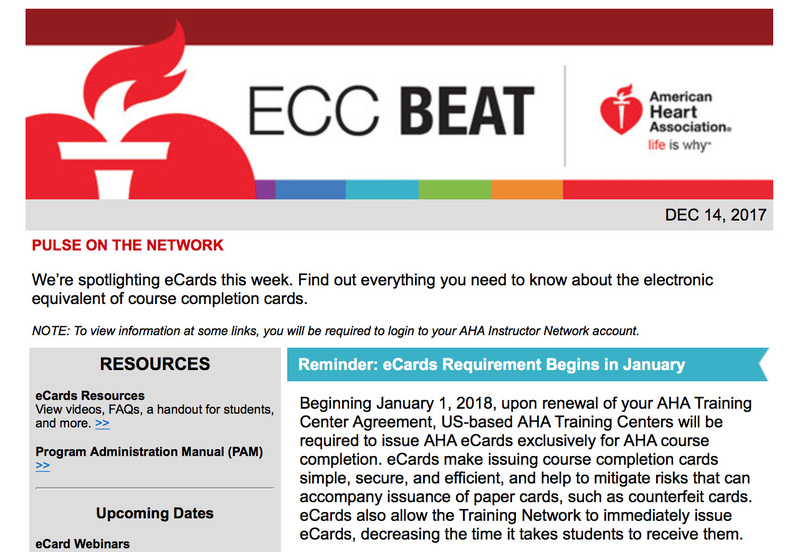 All American Heart Association Training Centers are required to transition to AHA ecards by Dec 2018. eCards also expire two years from the issue date, anything else is fake. Employers may verify that an AHA eCard is authentic by entering the card information at www.heart.org/cpr/mycards. The American Heart Association does not certify trainers, doctors or training courses created by other organizations. Any claims that training products or materials are “AHA Certified,” “AHA Approved,” “AHA Compliant” or “created by AHA certified” people, where the “AHA” means the American Heart Association, are not true and are usually fake website with fake certifications. The American Heart Association (AHA) does not give "Instant" anything or "Instant" wallet cards online. These websites are fake. All cards must be issued by an authorized training center of the American Heart Association. All online courses must be taken via the AHA Online portal at http://www.onlineaha.org, and skills test for the online courses must be done in person via an American Heart Association authorized provider. If you suspect fraudulent CPR/ACLS/PALS certifications related to the American Heart Association please contact the AHA at 1-800-242-8721 or email reportfraud@heart.org. ShowMeCPR is an Authorized Provider and an Authorized Training Center of the American Heart Association.